Another favourite photo and a venture into street photography for me. This photo was made last year at Toronto’s annual Buskerfest. I was walking the street, knowing there would be some interesting scenes to photograph. The street was extremely busy and it became difficult to get a shot that was not full of distractions. I like to isolate my subject as much as possible. Off the main venue, Toronto’s Yonge Street, which is closed to traffic for Buskerfest, there were several people sitting and chatting, including this woman, who was searching through her purse for something. For her, it was a break from the busy crowds and a chance to sit and have a smoke. Originally, I had titled this image “Old Lady at Buskerfest”, but on further reflection, I can’t tell if she is really that old. I don’t know her story, but the photo makes me want to know more. For now, it remains a moment in someone’s life, captured in a single image. 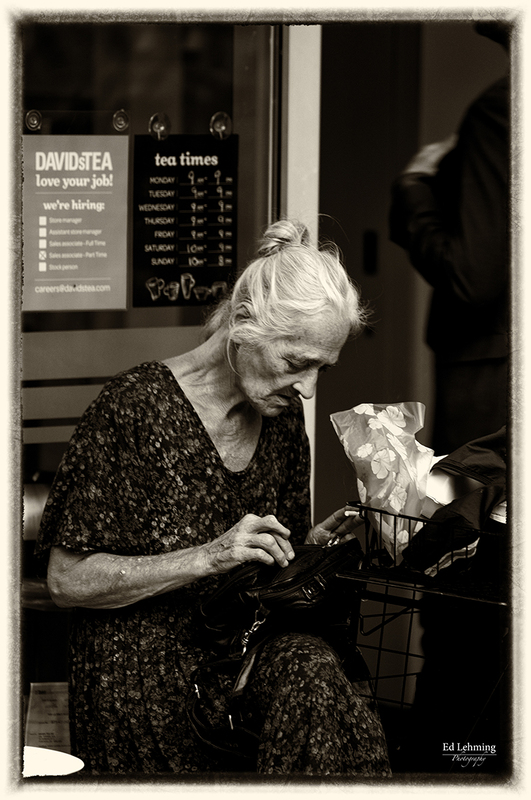 This entry was posted in Photography and tagged black and white, busker, busy, day, lady, moment, old, relax, search, sit, smakoe, Street on August 29, 2015 by Ed Lehming Photography. This remains one of my favourite photos. Partially because it was just a chance, unplanned, opportunity and secondly due to the sense of serenity it instills in me. The unplanned aspect of this photo was that I was travelling to the Yosemite Valley proper, with the intention of photographing some of Yosemite’s grand waterfalls. On the trip in, I happened to glance over my shoulder into one of the many steep ravines that the road crosses. I noticed a small cascade and pulled the car over to have a closer look. As I descended into the gully, I was greeted by this gorgeous scene of Alder Creek flowing over and around the moss-covered boulders. 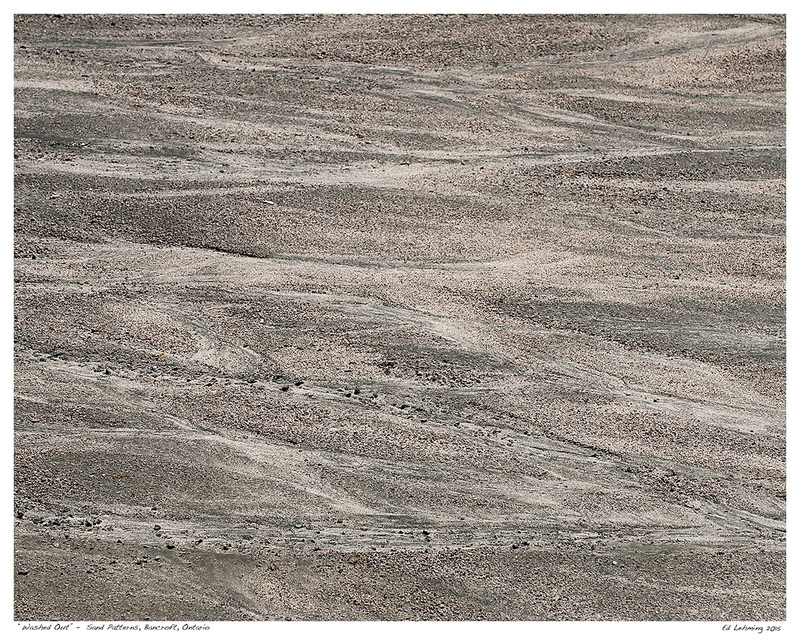 I was especially drawn to the water flowing lightly across the round boulder in the foreground. I find myself going back to this image time and again when I need to wind down. As a photographer, I’m finding more often, that these chance encounters, with my natural surroundings, provide more satisfying and unique images than some of the grand vistas. 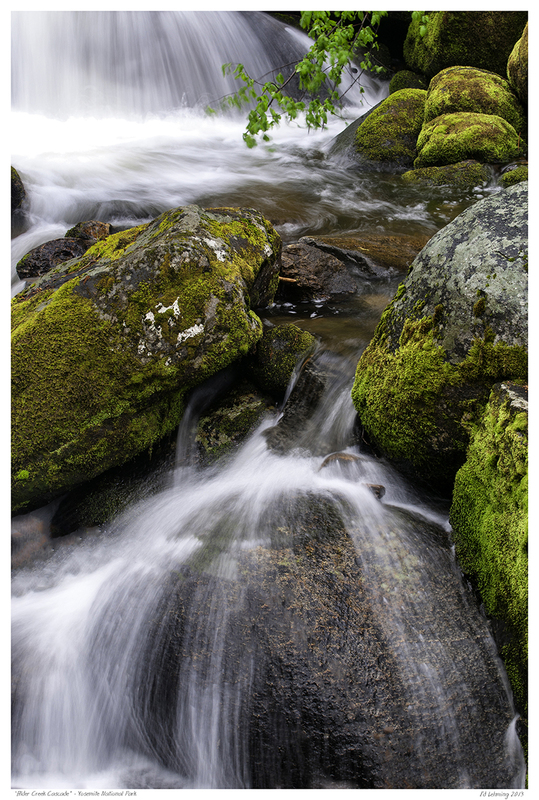 This entry was posted in Photography and tagged boulder, cascade, creek, flow, green, gully, moss, Nature, park, peacful, serene, Yosemite on August 28, 2015 by Ed Lehming Photography. Another visit to High Falls, the outlet of Baptiste Lake and the beginning of the York River. I keep trying to imagine the waterfall as it would have been before the dam was built above it. That would have been a sight to behold. As I noted in an earlier post, the dam was built to protect the town of Bancroft, some 5 miles down river, from being flooded in the spring (it still happens, but to a lesser extent). This was simply an opportunity to do a hand-held time exposure of the water spraying out between the logs. My maximum shake free exposure with my Tamron 70-200 f/2.8 is 1/8 of a second. It still amazes me just how good the Vibration Reduction technology is these days. I closed the aperture a bit on this to keep everything in focus. 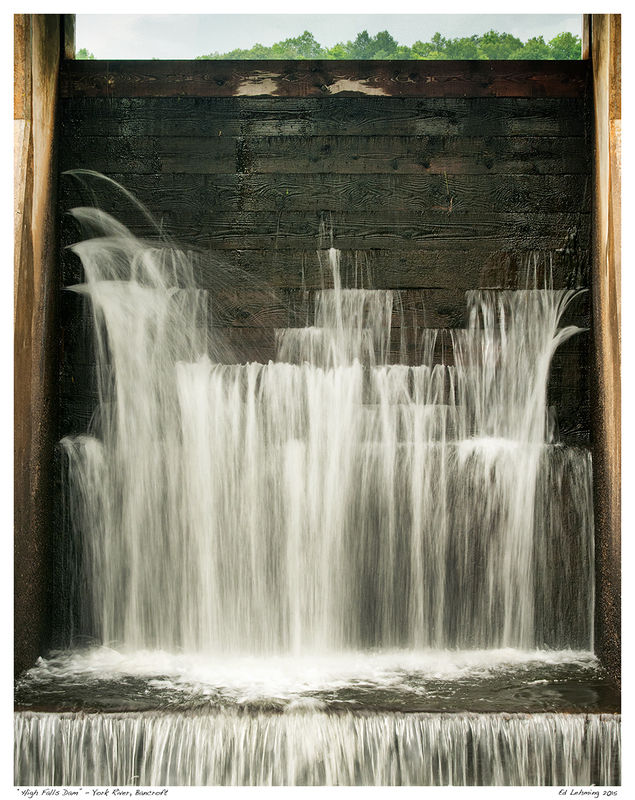 I liked the way the spillway naturally framed the image, the texture and colour of the wood, and how the spray stood out against the dark background. I may have to try this as a black and white at some time as well. There is something calming in images with soft flowing water that I really enjoy in this busy world. This entry was posted in Photography and tagged aperture, Bancroft, Baptiste Lake, contrast, dam, falls, High, lake, logs, Nature, river, Tamron, texture, time exposure, vibration, Water, water lake, wood, York River on August 28, 2015 by Ed Lehming Photography. A few weeks ago, I had the pleasure of spending the weekend with family and friends at Ontario’s Sauble Beach, on Lake Huron. It began as a wonderful hot summer day splashing in the surf and playing hours of volleyball. The forecast was for thunderstorms late in the day. We watched across the water as the sky gradually darkened. The storm approached over the lake like a black wall, slowly creeping our way. I took this as a wonderful opportunity to get some powerful storm photographs. 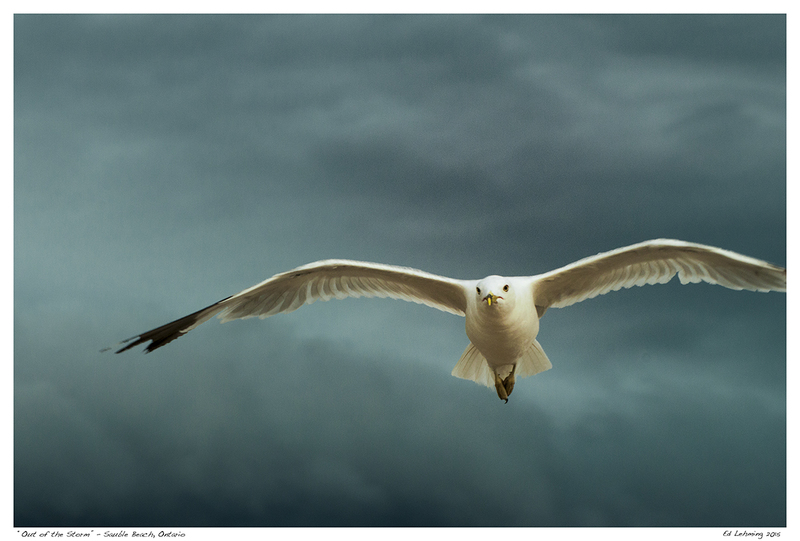 As I stood on the shore making photos of the storm, I was struck by just how bright the circling seagulls were, in strong contrast to the dark skies. This one kept circling me at just the right distance to make some good images. I’m really pleased at how it turned out. The biggest challenge was trying to keep him focused and framed properly. This entry was posted in Photography and tagged beach, bird, black, cloud, contrast, dark, flight, front, Lake Huron, Nature, ontario, pleasure, Sauble, seagull, storm, summer, wall, Water, weekend, Wildlife, wing, wings on August 27, 2015 by Ed Lehming Photography. Another early morning image. It’s the time of year when nights get cool and the mornings are damp and misty. Dew clings to everything and the low rising sun lights up the world in silvers and golds. Spider webs that go unnoticed during the day shine with water droplets that appear like silver threads. I noticed this web in a tree near our camper and the light was just right to reveal the fine details of this particular spider’s work. The curves and arches in the web really jump out, though it appears this web may be in need of some work. 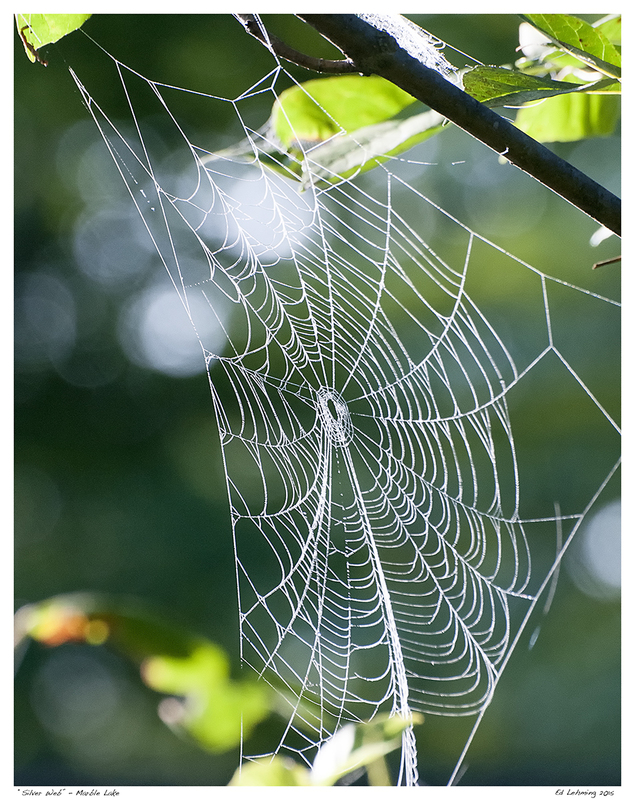 This entry was posted in Photography and tagged Bancroft, curve, dew, dwn, light, list, Nature, observe, ontario, outdoors, pattern, silver, Spider, summer, web on August 26, 2015 by Ed Lehming Photography. A classic scene to those of us who spend time in the north. After a cool night, the waters of the lake are warmer than the surrounding air and a thick fog forms. As the sun rises higher in the sky the fog begins to rise higher and higher to eventually form small clouds. The small clouds eventually join together to form larger clouds. It’s a fascinating process to watch. I often look up at summer clouds and wonder what lake that cloud came from. Last Sunday was no exception. The warming sun played across the lake as mist swirled and rose higher and higher. The warm glow of the rising sun shone on the distant shoreline in golden hues. For me, it’s such a calming scene and I could spend day after day watching each new day dawning, just like this. 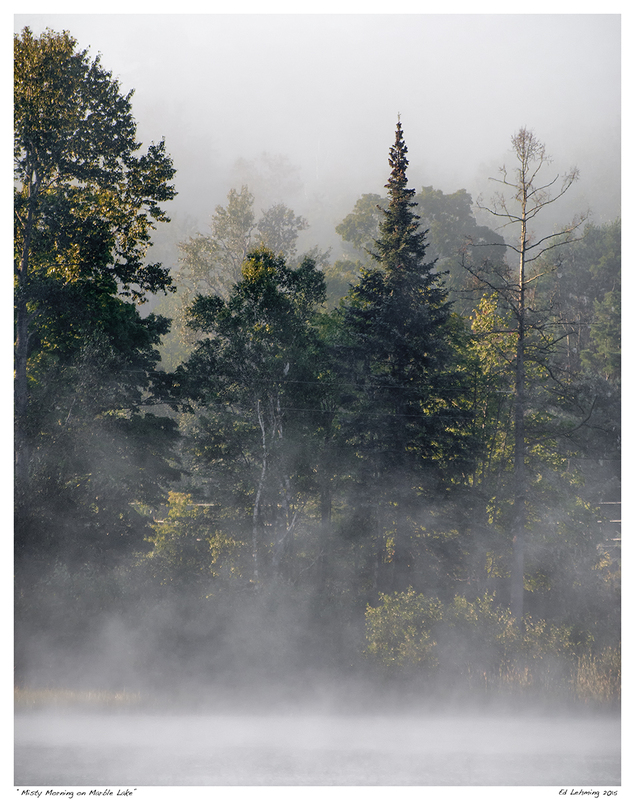 This entry was posted in Photography and tagged Bancroft, clouds, dawn, fog, golden, lake, landscape, mist, morning, rising, shore, sun on August 25, 2015 by Ed Lehming Photography. I can’t turn it off. I see patterns and photos everywhere. Last weekend I was volunteering at A Place for the Arts in Bancroft, looked out the back window and saw these beautiful patterns in the sand in the back parking area. There had just been a big storm with torrential downpours the day before (which seems to be the norm for Bancroft lately). The deluge of rain created a wide band of water in the parking lot, sorting the sand and making these wonderful patterns. It may not seem interesting to some, but I thought you’d enjoy this artwork that nature creates, on a fairly regular basis for those who take the time to notice and appreciate it. This entry was posted in Photography and tagged Bancroft, Nature, pattern, rain, sand, storm, wash, Water on August 21, 2015 by Ed Lehming Photography.